Offshore engineering design faces numerous geotechnical, hydrodynamic and structural challenges related to the nature of the operating environment. 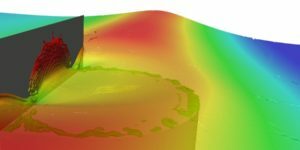 The Numerical Modelling team at UWA have developed innovative computational techniques and tools necessary to model offshore processes and infrastructure, with a focus on developing computational algorithms capturing multi-phase sediment response, consolidation and strain rate effects in large deformation problems, multi-body hydrodynamic responses and non-linear soil-fluid-structure interaction. A range of numerical modelling capabilities are available, ranging from analysis with commercial software to development of in-house software and analysis methods.